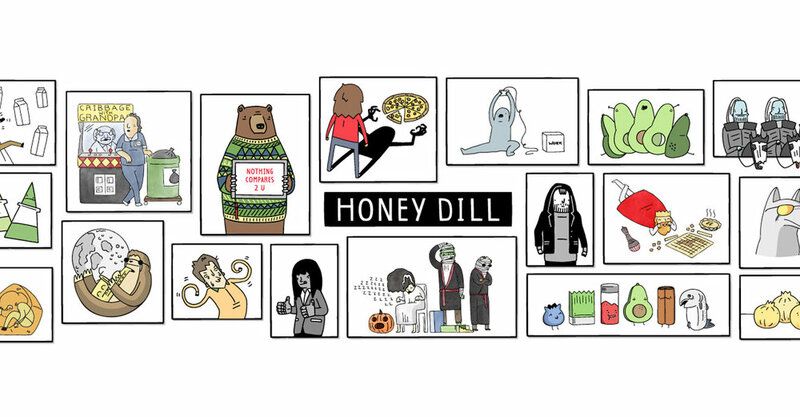 Honey Dill is a webcomic series loosely based on humanity. But also pop culture and cats and food. AND ROCK AND ROLL. Ahem. The comic is produced by Ryan & Laura Harby, who live in Winnipeg, Manitoba, Canada, the World. Ryan creates art for pay and for free. He can usually be found watching either Kids in the Hall or King of the Hill. Laura serves as the Honey Dill support team, she can be found at the local library (where she works) or at home on the couch (where she knits).